Medium - $56.99 Only 5 left! Large - $56.99 Only 3 left! In a galaxy far, far away there is an evil force trying to gain power and control the universe. This force is called the Sith and there can be only two at a time, a master and an apprentice. The master teaches the apprentice all the ways of the Sith until the moment where the apprentice takes over. One of the scariest villains to ever be a Sith warrior was the apprentice of Darth Sidious, Darth Maul. He wielded a double bladed lightsaber and had a passion for destroying the Jedi. 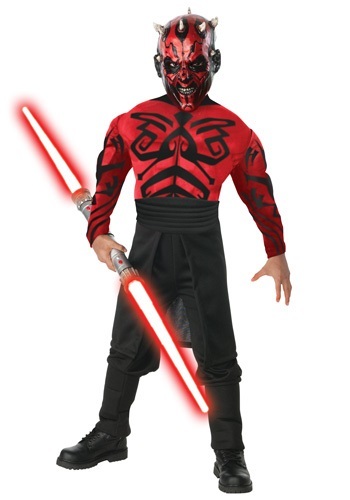 Now your little one can look like vicious Sith Lord in this Star Wars themed costume!